Fresh and light, the flavors in this are so amazing you’ll want to lick the plate! You can serve it warm or cold. We like it best at room temp. Boil 1 pound Linguine or Spaghetti Pasta to desired doneness. LOVE this! Remember when I made a similar salad for you and you screamed at me for using a cup of oil? Good times. They were awesome! How could I forget?! This was a spin-off from that very night! Thank you, thank you, thank you!!! 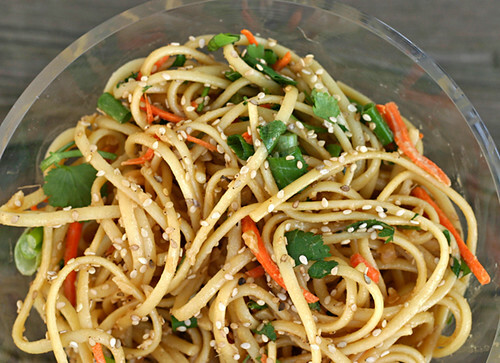 I’ve been trying to make ‘peanut noodles’ forever…with limited success. It’s a knock-out dish, but has to be done right. Simple, but perfect blend of seasonings in the dressing. Can’t wait to try this! Now go open that CD I gave you last year. It has all these recipes on it.